Early start on Tuesday with the first sampling of the cruise scheduled to start at 0600. A few winch jitters before we finally got to witness the CTD disappearing beneath the waves at 0718, and there was much rejoicing! 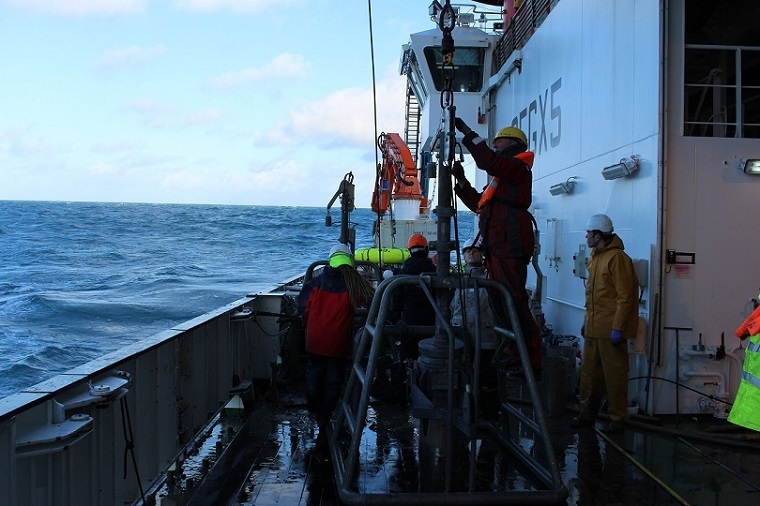 Apart from three CTD casts for the majority of today we have been using a NIOZ Corer to dig up sediment from the sea-bed, and it seems like an appropriate time to introduce two instruments which will be mentioned a lot of in this blog. Transmission (particles in the water) and other variables. Scientists on deck then use this information to decide at which depths to fire (close) the water bottles as the CTD is raised back through the water column, in order to catch water from specific depths for analysis back on deck. A 'CTD' as pictured as it is being lowered into the Celtic Sea. The term corer is a general term used to describe instruments designed to collect samples of sediment from the seabed. The samples are then brought up to the surface where they may be analysed, or used in experiments. This could happen in one of the several laboratories on the ship, or they may be stored for analysis back home. A NIOZ corer being setup on deck. 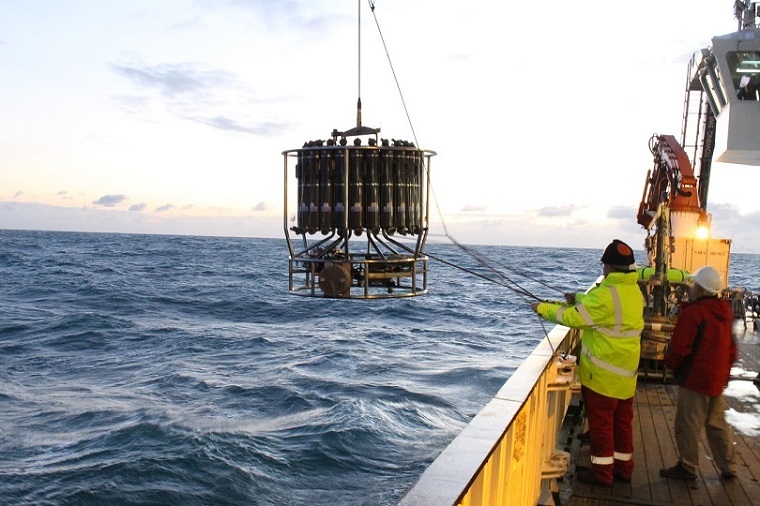 One of the scientists using water collected by the CTD and sediment from the NIOZ corer is Briony Silburn (from Cefas), who is running an experiment to investigate the impact of different types of fishing trawls on the seabed. When trawling, the heavy weights attached to the trawl nets are dragged along the sea floor; disturbing the sediment causing it to be mixed into the water column above (this is called resuspension). When this happens the nutrients contained within the sediments also get released. Briony is using mud from the core which is added to a large container containing water from the Celtic Sea, and spinning magnets are used to continuously mix the water so that the mud doesn’t fall to the bottom. This experiment is repeated three times, using mud from the first two, four and six centimetres of the seabed. Over a 24 hour period the nutrient concentrations of the water are measured, and by comparing the measurements from all three experiments it is possible to get an idea of how the concentration of nutrients resuspended varies as the trawl weights penetrate deeper into the seabed. These nutrients are then measured on board the ship (more about them later). This research can then be used to influence the design of trawl weights so that they are less harmful to the marine environment.